What if you could go to medical school and study with some of the most respected doctors in the world for free? Such a program exists in Cuba. Each year, the Cuban government pays for 10 to 15 students from the United States to study at the Latin American Medical School in Havana. Sol Bockelie of Bremerton is in his first year. When Bockelie and I spoke earlier this month, he was in the Northwest for the holidays, trying to fit in visits with friends and family members before heading back to Havana. Bockelie was also hoping his doctor here would fit him in for a routine checkup. “And I called, and nothing was open, and they referred me to the emergency room, which I don’t really get because I just wanted a checkup,” Bockelie said. This scenario probably wouldn’t happen in Cuba. Dr. Melissa Barber is the U.S. coordinator for the Cuban medical school scholarship program. She’s also a graduate. Barber says Cuba has more doctors per capita than any other country in the world. “Within every 10-block radius there is a doctor that cares for every family in that 10-block radius.,” she said. Highly skilled physicians have become one of Cuba’s best exports, serving the sick and dying after major disasters like the earthquake in Haiti and the Ebola outbreak in West Africa. According to the World Health Organization, Cubans are as healthy as Americans at a fraction of the cost. Bockelie, 28, started to become interested in Cuba’s medical system after reading the book “Cuba’s Healthcare System, Where Humanity Comes First” by Ellen Bernstein. Bockelie earned a double major in pre-med and political science at the University of Washington. He worked for a few years at Seattle BioMed, a company developing a malaria vaccine. He was planning to continue his studies in the U.S. when he found out about medical school in Cuba. “I was really interested in how this island that’s so financially poor, how they have such a rich and effective public health care system,” Bockelie said. The fact that everything was paid for was also a major draw to study in Havana. “We’re going to graduate and be debt-free. It’s amazing, that gift to the U.S. students,” he said. So how did this this island country, declared off-limits by the U.S., end up providing a free medical education to American students? The idea came when the Congressional Black Caucus and the Latino Congressional Caucus visited Cuba in June 2000. They were impressed by Cuba’s medical system, which made them think about the lack of primary care doctors in the poor areas of their districts back in the U.S.
Castro opened up the invitation to students from across the U.S. when he gave a speech at Riverside Church in New York in 2001. So far, 111 students from the U.S. have graduated and 46 are in residency. Medical school in Cuba is a big time commitment. Instead of four years, the coursework takes seven years to complete. But Bockelie isn’t fazed. “I’m happy to be down there in Cuba. There is so much to learn, and I don’t think I’ll ever understand the place completely. That seven years, I know, is just going to fly by,” he said. Bockelie is currently working to become fluent in Spanish before jumping into his official studies. Free language classes are a part of the program. When Bockelie isn’t in class, he’s budgeting his monthly stipend from the Cuban government of 100 pesos, which pencils out to roughly $4 U.S. When he graduates, Bocklie plans to practice primary care medicine in low-income communities on the Kitsap Peninsula. 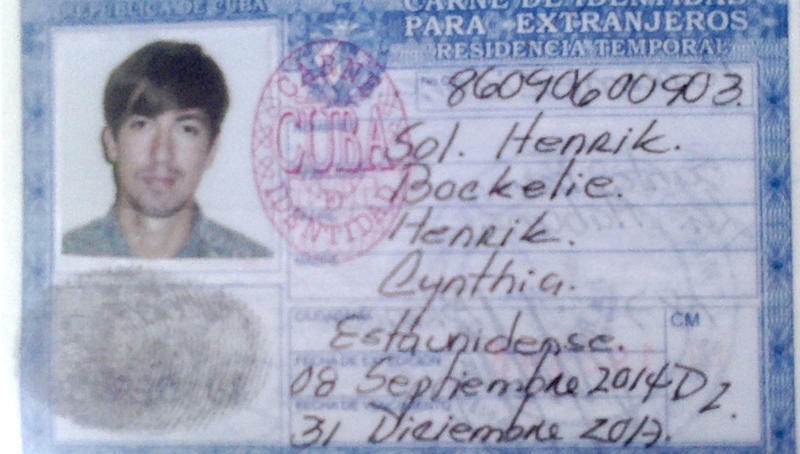 You can learn more about Bockelie’s experience in Cuba by visiting his blog.